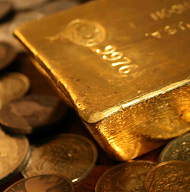 GOLD TRADING in London saw a rising US Dollar curb wholesale bullion prices below $1240 per ounce yet again Friday morning, but the metal added $10 for the week as Asian and European stock markets ignored yesterday's steep rally on Wall Street to drop for the 13th time in 19 sessions this month. Shares in US tech giants Amazon (Nasdaq: AMZN) and Alphabet (Nasdaq: GOOGL) both fell over 4% in after-hours trading last night after missing analyst forecasts for their latest earnings reports. 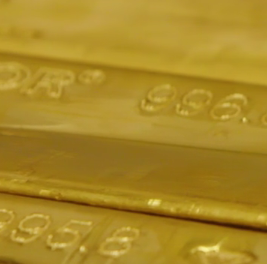 Slow gold trading in Asia today "[was] just a temporary lull in a more structural move higher in the coming days," reckons Australasian bank ANZ's analyst Daniel Hynes. With US third quarter GDP data due out later on Friday, "Investors will keep a watch on New York trading" the Japan Times quotes one Tokyo analyst. "Investors [have] continued to reduce stock market exposure on worries over fundamentals," says another. "For those eager for signs that this is not the end [of the 10-year rise in world stock markets], one need look at the performance of high-yield bonds," says a column at Barron's. "Usually, junk bonds move in sync with small-cap stocks," but corporate debt rated below investment grade has lost only 1.2% so far this month versus a 9.1% drop in the S&P500 stock index. "A junk-bond implosion might not be imminent," agrees a column at Bloomberg. "But if risk-off sentiment intensifies, the worst stocks and the worst bonds will be one and the same." 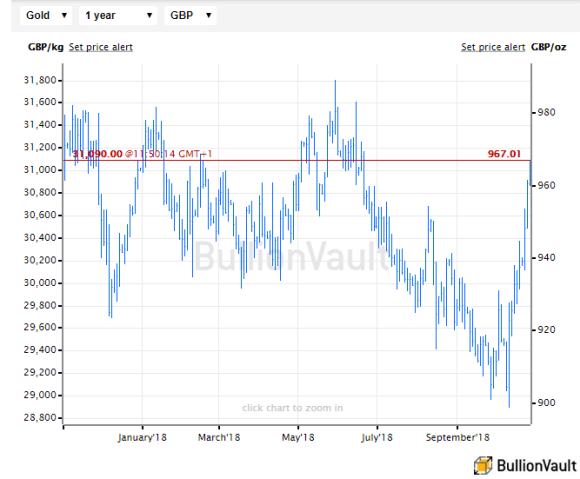 The rising US Dollar today saw gold priced in British Pounds trade up to £965, erasing the last of 2018's previous £67 drop as wrangling continued between London and the European Union over finalizing a deal for Brexit next March or risking " no deal chaos". 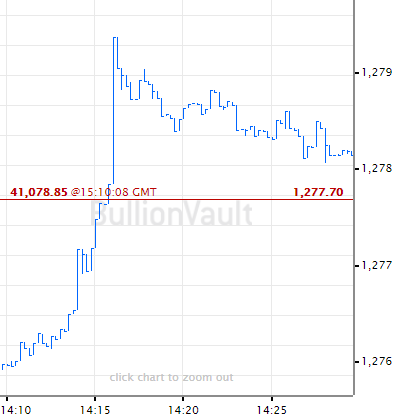 Euro gold prices also rose to their highest since June on Friday, extending the week's 2.1% gain to come within 40 cents of €1090 per ounce despite stronger-than-expected consumer sentiment surveys from both France and Germany. Most Eurozone government bond prices rose as stocks fell, but Italy's cost of borrowing rose above 3.5% on 10-year debt, widening the spread over German Bund yields to 316 basis points. Crude oil meantime erased yesterday's rally, trading back down to $76 per barrel of Brent, as Turkey's President Erdogan said he has more "information and evidence" about oil giant Saudi Arabia's murder of US-based journalist Jamal Khassoghi in Istanbul. Ahead of the US GDP data, the Federal Reserve has been "very insistent" about planning to keep raising Dollar interest rates, said Mohamed El-Erian – chief economic advisor at insurance giant Allianz – to CNBC this morning, failing to offer investors "a single soothing word" during this month's stockmarket plunge. With Shanghai's stockmarket managing a small gain this week after Beijing launched a raft of support and stimulus, "We don't need to worry too much" about China's weak Q3 growth – the slowest since the global recession of 2009 – reckons Hu Yuexiao, chief analyst at Shanghai Securities. "[Chinese] investment has stabilized and started to rebound, and the weakening of growth may have possibly stopped."